When we came back from our one week holiday in the South of France we were greeted by a surprise. Between our mint plants (we have tons of those don’t ask me why) there was a plant that we did not plant nor did we sow the seeds. A tomato plant had made its way out of the rich potting soil in our flower box. Tomatoes are easy to recognise, their distinctive smell gives them away. Now we have not yet been back for a month, but the plant has grown and taken a place in our hearts. Majestically this tomato has outgrown all of the mints, we cut them regularly. If anyone wants mint let me know, we aren’t fans of mint at all and we have two flower boxes over growing with mint. 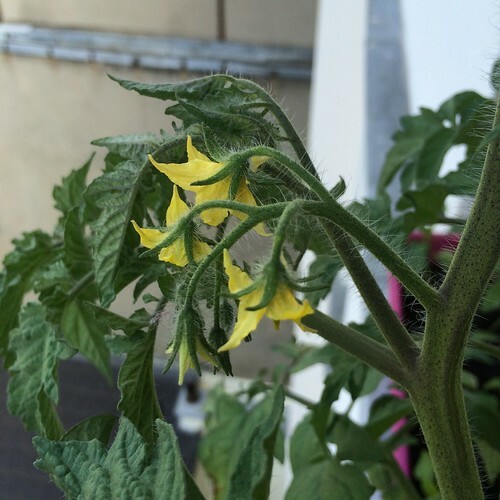 It’s not peppermint nor the Moroccan variety… Back to the tomato, it’s now started to flower. By the looks of it we might be lucky and will be serving sun ripe tomatoes in the near future. Besides the flowers in bloom there are some more grapes of flowers sprouting here and there. Until this day it still is a mystery to us how this plant made its way there. Did we put a tomato seed into the box without noticing? Was it in the soil? Is a bird responsible? In the end it’s not that important. But the mystery still lingers. This spring I sowed some capucine seeds into another flower box. Not a single capucine has shown its presence. But the seeds that I picked off my mother’s dried flower heads are now in full bloom. 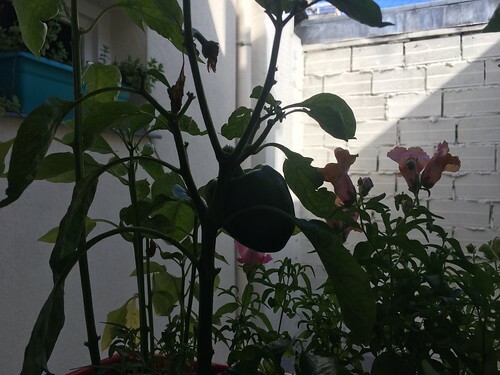 A bell pepper plant that did not at all want to grow last year and that lived through the winter with 4 leaves is now proudly spotting a green pepper growing every day. I recall when about 20 years ago we planted dates and ended up with sunflowers instead. We eventually did get some nice date trees but that needed a whole lot of patience. Or when the avocado sitting over the water-glass would not sprout a root but the one in the soil would astound us with its growth. This strange behaviour of plants reminds me of one thing in life, having kids. Like people wanting to become parents a gardener might try to make his or her flower dream come through but struggling years for a root to grow or a flower to bloom. Like a gardener future parents sometimes find themselves amazed by the news that without trying hard there is a child to come. Flowers and children they can amaze us. Previous Let’s meet where the kids play! We have a term for plants like you describe. I don’t know if it’s something I picked up in my native Texas, or if other people use it, too, but we call them “volunteers.” So what you have there is a volunteer tomato plant! Enjoy it! I love that you got sunflowers instead of dates 😀 Great post, Solveig. Sunflowers are beautiful, and well I am not sure that the dates would be able to carry fruit in a German living room. Maybe I’ll grow some dates again (I have a good source of organic Iranian dates, I think read about Iranian dates on your blog during the A to Z Challenge, so now when I eat my Iranian dates I think of you). I get a lot of mini-tomato plants which come in with my compost – throw out a seeded tomato, the seeds don’t get destroyed in a domestic composter. That’s okay by me… the seedlings go back to make more compost. Then there are the exotic plants that come from the bird seed. Some seeds have to pass through the bird to start germinating. I have some very interesting ‘wild’ plants from those! Sunflowers could be from bird seed… but I love the idea of growing dates! Composts are great places for having a rich garden. Do you have an open or closed compost? I have friends who have an open compost in their back yard and well it’s rich with potatoes, tomatoes, flowers, pumpkins, and everything that one might enjoy visually or taste wise once summer comes along. Once the dates did grow they did give us beautiful little palm trees, but apartment dates won’t ever reach their impressive natural heights. Hi Solveig. I pottered over here today to see how you are and realise you are MIA. I hope you are okay and that you’ve just been busy or needed a rest. Anyway, hope you are the family are well.